ZCY60R and ZCY45R full hydraulic side dumping rock loader is crawler type loading equipment, main applied in loading of coal or rock in the coal tunnel, coal and rock mixed tunnel, and full rock tunnel. With the features of Big force, good mobility, work in full section, safe, multifunction. Besides of loading, it can also works as the work plateform for supporting, short transportation, floor cleaning and rib cleaning. 1. Big shovel force, good loading capacity: Sealed lubricated crawler is applied, the traveling components such as the crawler shoes, the collars, etc are all quenched, long work life, wearable. 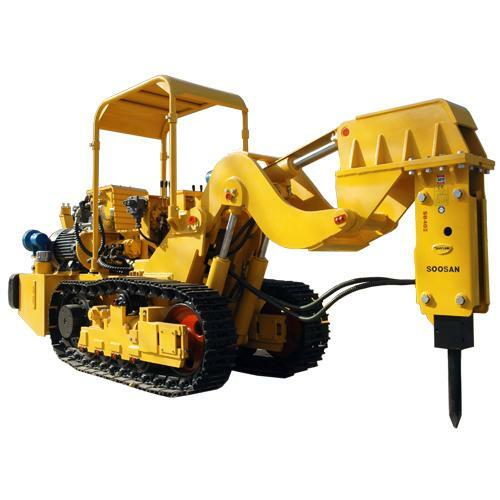 The shovel and pulling force is large, can be used in the smooth or tilt tunnel in various sections; The edge of the bucket is made by special material with high strength and wear resistance character, and the work life is long. 2. Traveling stable, traveling speed 0.7m/s(2.5km/h), transport at high efficiency. 3. Smooth operation, small punch, more suitable to the underground space. 4. Sealings are good, no leakage. 5. Can be matched with other equipment such as drilling rig, conveyor, and belt conveyor, or the shuttles. E. Excellent dinting ability and wall cleaning ability make it possible for 100% mechanism, no shovel work.